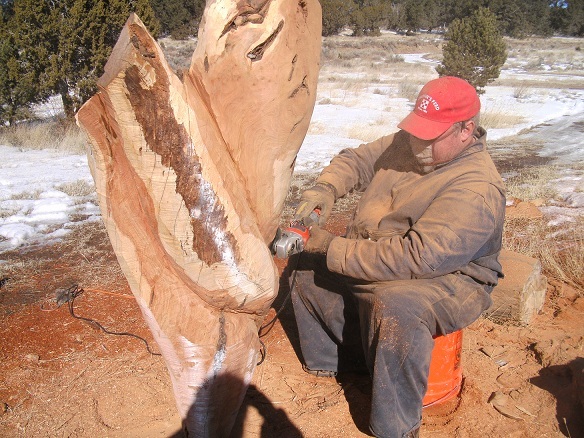 “Twister”, our newest and to date largest sculpture was chainsaw carved from beautiful Alligator Juniper from the Sacramento Mountains in Ruidoso NM. The tree was estimated to be over 1000 years old. Alligator Juniper only grows in the mountains of New Mexico and Arizona, between 6300 and 7600 elevation. Making it a pretty rare and hard to find species. 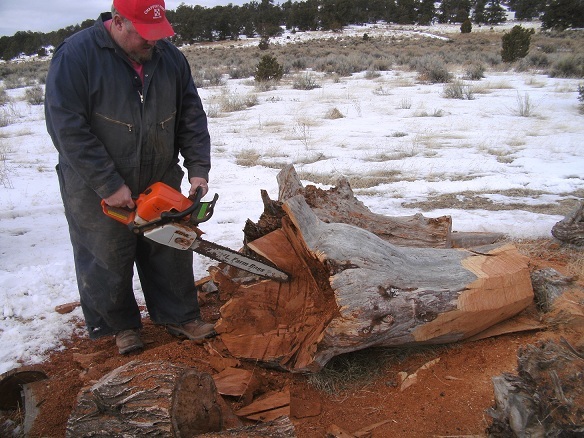 We only use dead standing logs that come from either forest or private owner cleanup. This mammoth of a log stands 5ft tall (as you can see in the photo of me standing next to it) and was 60″ in diameter. We would walk by this log day after day trying to decide how to best represent such beauty. 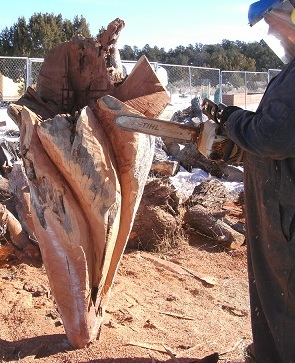 We knew we didn’t want to cut it up into smaller pieces, so a larger sculpture was the decision we came to. Scott wanted to follow the lines and natural curves that the log had already. Therefore came the twisting effect and the end result giving it its name. To me it looks like a tornado touching down. This is what would be the back of the piece. As much natural elements were left as possible. The top is actually the root base, giving it a dramatic effect with all the natural pieces protruding here and there. We also left a few of the voids open, not filling them with inlay, to give a more natural look and not overkill the inlaying. Turquoise and Abalone Shell were used, and they made the sculpture really pop with some color and sparkling. 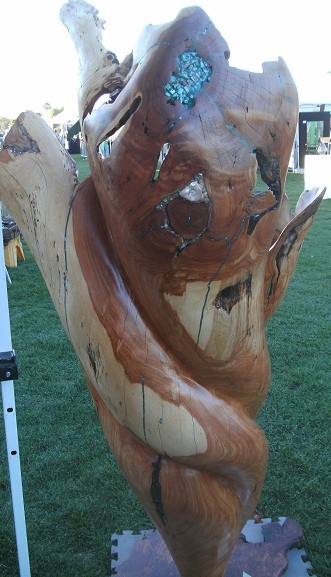 Here is me displaying “Twister” at the SW Arts Festival in Indio CA. It is big alright and got a lot of attention and comments. Because some of the voids were so large, I was able to inlay some large pieces of both turquoise and abalone and it really showed them off. Note some of the burling on this piece. This sculpture is meant to make a statement where ever it is prominately displayed. And sure to be the center of attention and the conversation. Since it is so rare and is a one of a kind sculpture it’s going to be hard to let it go. But we’ll be happy when “Twister” finds its perfect location and the individual that will treasure this spectacular sculpture for many years to come. It was quite an undertaking when Scott started this sculpture. Many back breaking hours, sweat, blood, creativity and love went into creating this piece. And our neighbors enjoyed seeing the progress. Especiall when Scott was carving the inside. Comments were made that he wore it as a hat for some time. Starting the twists that curve up the sculpture first with the chainsaw and then grinders took a lot of effort. The piece had to be turned, moved and layed on things to do all the sides. 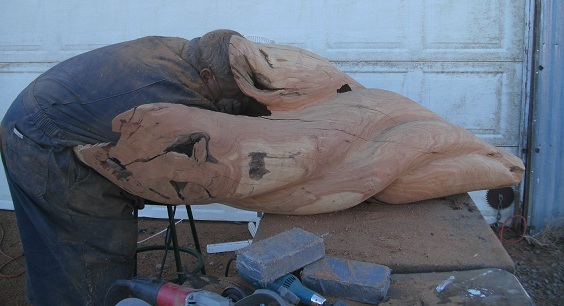 And this piece was quite heavy while the carving process was going on. 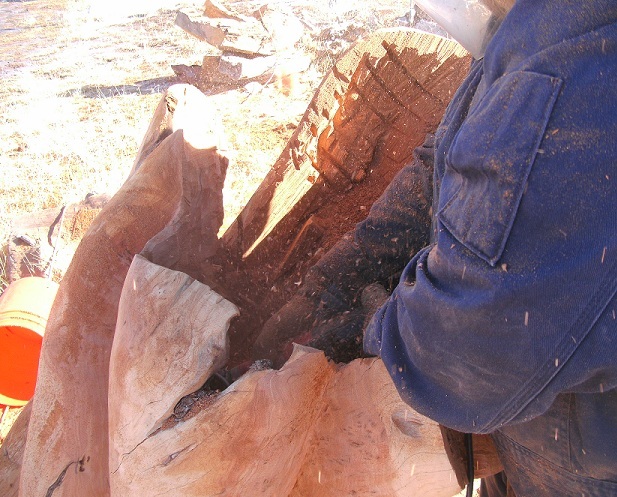 Using the chainsaw to create some of the curves on the outside. Being careful to not go through the piece. 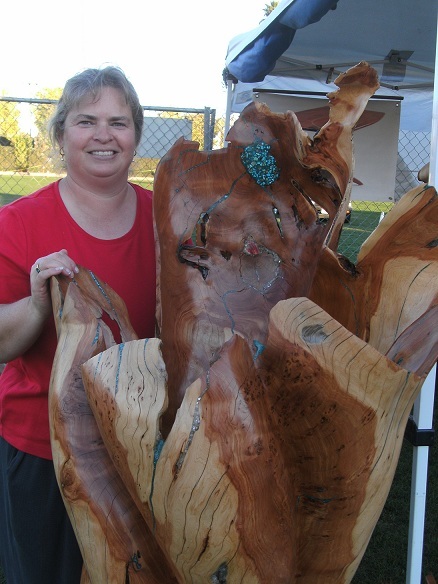 Scott has gotten quite skillful at using the chainsaw to create these pieces. Look at that sawdust fly. Scott is starting to carve the inside. He would go between the chainsaw and grinders, removing more and more material till he got to the bottom. Scott wearing his hat. HA HA. This was the hardest part of the carving process. Inside Scott had to create some bends and curves to try and mirror what was going on on the outside. This is what the inside looks like after Scott carves it. Now it’s my turn to inlay all the turquoise and abalone. That was a long process that had to be done inside the cabin, because the weather took a turn for the worse. Once I was done the sanding process began and went on and on and on. 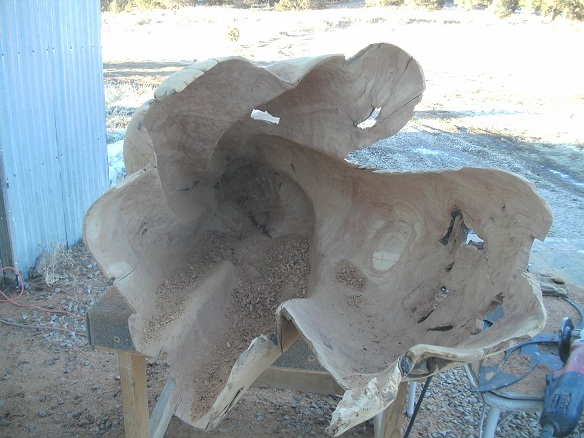 Scott then made a base from Redwood burl (see above finished photos) and the piece was ready for finish. You are currently browsing the Shangrilawoodworks's Blog blog archives for February, 2011.